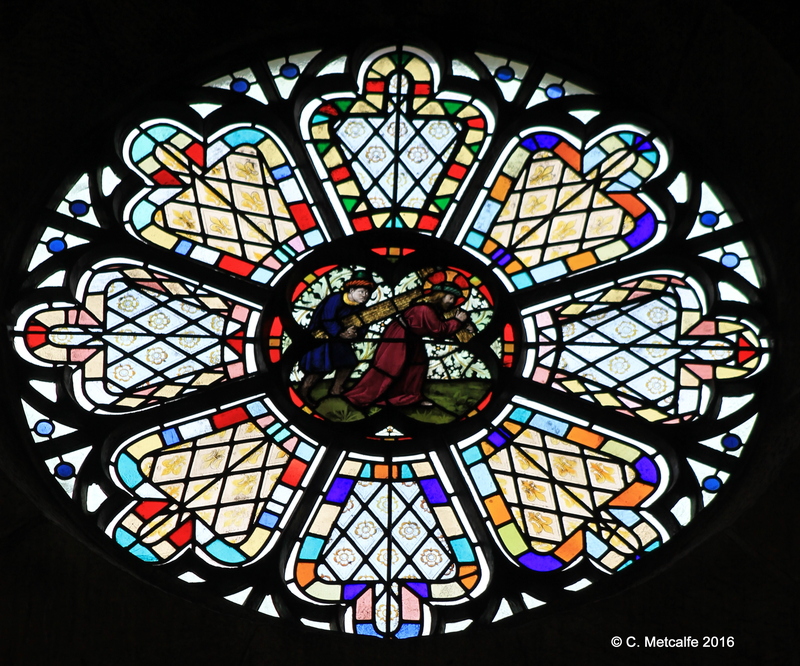 Some of the windows in St Swithun’s church tell the story of the stages towards the Crucifixion, and Resurrection, of Jesus. 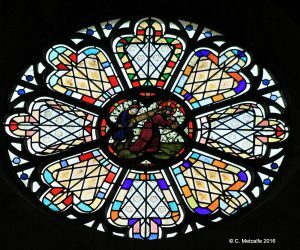 Two windows in the clerestory on the north side have roundels showing ‘The Agony in the Garden of Gethsemane’ and ‘Bearing the Cross’. If you enter St Swithun’s from the High Street, stand by the south door and look up. Ahead and to the right, you will see the ‘Agony’ picture, and next to it, above the Choir stalls, the ‘Bearing of the Cross’ picture. 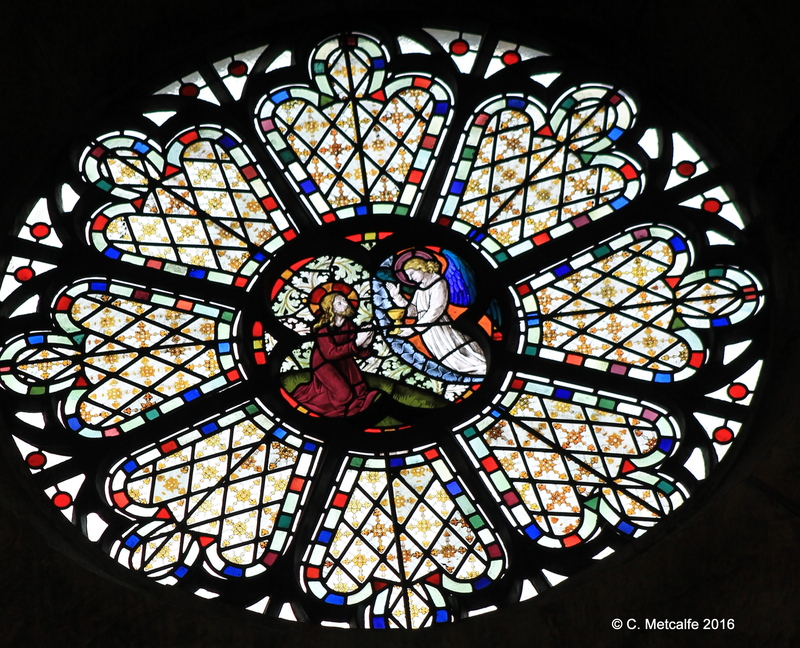 These north clerestory windows are thought to be late 19th century work, but the roundels may date from the 1940s. A sentence in the 1946 Guide to St Swithun’s Church tells us that ‘the centre quatrefoils are being filled with scenes from the life of Our Lord’. In the Chapel of the Nativity, to the left of the main altar, the picture on the top right hand side also depicts Gethsemane. This beautiful blue glass was obtained in 1935, when this Chapel was created, following the removal of the organ to the gallery. Two windows were created in the east wall, and the stained glass was put in. The glass, it is believed, originally came from Ballina, County Mayo, from a mansion burnt down in an Irish rebellion. 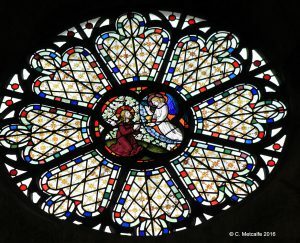 The glass was bought ‘with the proceeds of the sale of the second edition of the 1946 Church Guide’, and ‘through the kindness of a cousin of the late Bishop Gore’, who ‘had the glass in his studio for many years’.